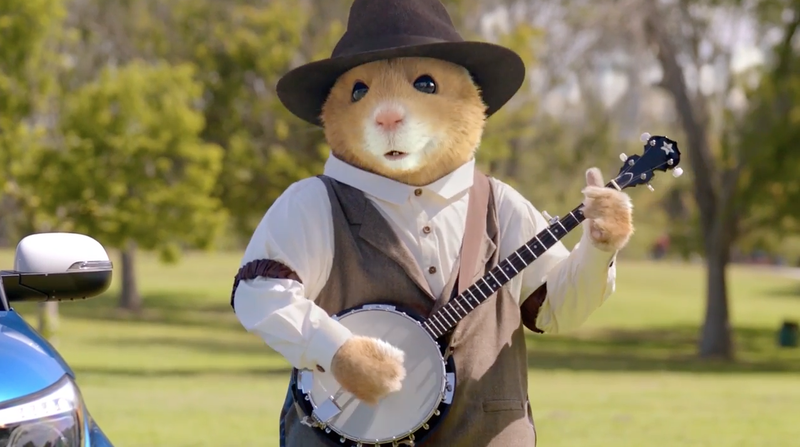 That prize banjo scene from the film Deliverance gets a CG-infused makeover in Kia's latest ad, featuring its trademark hamsters, who have basically become the Barbie doll of brand mascots—they do everything, and probably have a better life than you. In agency David&Goliath's latest pop culture-infused campaign, a lone guitar player (Nathaniel Rateliff of Nathaniel Rateliff & the Night Sweats) kicks off the melody to "Dueling Banjos." A cherry red Kia Soul pulls up alongside him, and his tune is joined by a banjo, played by a country-clad hamster with an easy grin. Things look set to go on following the trail laid down by the original source material, where the guitar and banjo player feel each other out and ultimately join in a musical explosion, but that first hamster is quickly followed by another hamster—with an electric guitar. This sparks a different kind of duel, one in which hamsters and humans alike dash over with a variety of instruments—including a sitar, African and Korean drums, and a bagpipe—to join the band. In previous ads dating as far back as 2009, Kia's Soulful hamsters have rapped, time traveled and even gotten very, very lucky. But the agency calls this Kia's most ambitious hamster production to date. "Soul Jam" required 3,000 hours of computer-generated imagery for the hamsters alone. And ethnomusicologists, including Dr. Steven Loza of UCLA's Herb Albert School of Music's Department of Ethnomusicology, helped inform the cultural authenticity of nearly 30 human musicians, including the instruments, dance and dress. "Music really is the one true universal language. It's something that everybody can understand, something that everybody can feel," says director Colin Jeffery in a behind-the-scenes video, shown below. "The idea here is to bring different musicians, instruments and cultures together to create something unique. We're uniting people through music, and obviously looking to have a little fun." "The hamsters have always been plugged in to what is going on in the world around us, and in the 'The World Needs More Soul' campaign, they are back to share their infectious spirit of optimism and celebrate things that bring people together like music and dance," adds Michael Sprague, chief operating officer of Kia Motors America. "With each Soul execution, we strive to bring a fresh musical perspective, and 'Soul Jam' blends a variety of styles and cultures with a highly recognizable piece of music to create something fun and different that stands out from the crowd, just like the Soul." This is all much ado about music, but its nostalgic notes help invest emotions into its exuberant conclusion. The eager flight by humans from the city to the country also reminds us that, for all the advancements the world has made, it's a more natural kind of connectivity that makes us really happy. And because Kia just couldn't help itself, three emoji round out the tagline, which—as far as we can tell—reads "The world needs more peace, love, hamsters and soul." That's basically an open invitation for a hamster reproductive joke, but we'll leave that up to you. It's hard to argue with the overall sentiment. The ad is slated to appear in National CineMedia's FirstLook pre-show program, which counts over 34,000 screens nationwide. It will naturally also be supported by social media, digital and out-of-home elements.